Appearance: A large, high content wolfdog. O'Riley strongly resembles a Tundra Wolf in coloration and build. His mostly gray two-toned pelt this is accented by tawny accents on his face, body, and tail. Silver can be found mixed in his darker fur, especially around his back, tail, and thighs. His eyes are pale purple, and a callback to his Helsi heritage. The most obvious hybridization is in his face, which has a melanistic mask. Personality: Highly intelligent and completely ruthless, O'Riley is a Machiavellian schemer and manipulator, suspicious as to the motives of everyone around him. Convinced the path the power and prestige is through playing the political game of Salsola to his own best advantage, O'Riley knows the value of a powerful alliance or a shared enemy. When dealing with Outsiders and "inferior" others, he is confident to the point of arrogance and sometimes explosively violent. Biography: O'Riley Eternity is a member of Salsola. 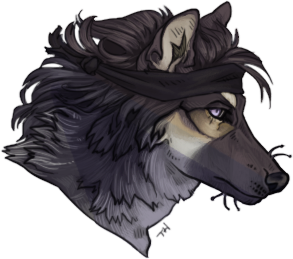 An ambitious mostly-wolf hybrid, he is a high-ranked member with a penchant for violence and connections to some of the pack's most powerful and notorious families.